Space conserving dish drainer takes up very little space on counter and can also fit in most sinks. 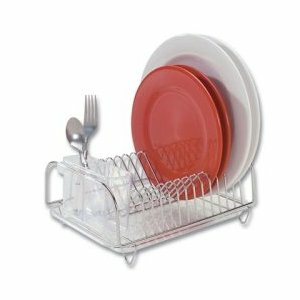 The dish rack is ideal for apartments, office, dorms, RVs and other small areas. Dishes drain quickly in this compact stainless steel draining rack with clear plastic detachable cutlery holder and bottom tray. This dish drainer gives you enough drying capacity for 12 dinner plates and cutlery. 12-Inch by 8-1/2-inch by 5-1/2-inch.